Burnley failed to climb in to the qualifying spots in Group B of the Premier League Cup after suffering a 4-0 defeat against Blackburn Rovers at the Globe Arena. Michael Jolley's side, who were beaten by their rivals at Ewood Park earlier in the campaign, were outside the top two on goal difference having accrued four points with a draw against leaders Sunderland and victory over Cardiff City. But they failed to add to their haul despite an encouraging first half showing at the home of the Shrimps. The Clarets, without their usual quota of senior players, presumably due to the club's involvement in the FA Cup at the weekend, started well and Oliver Younger glanced a header over the bar from Josh Ginnelly's set-piece after Matthew Platt was penalised for a foul on Daniel Agyei. 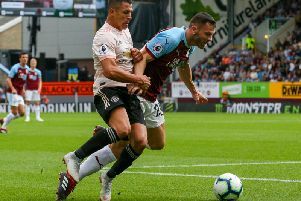 The Burnley defender was then involved at the opposite end, getting across well to block Connor Thomson's left-footed strike after the forward was found in space by Joseph Rankin-Costello. Rovers went close soon after and it was Anthony Stokes, who has made seven appearances for Owen Coyle's men in the Championship this term, with the chance. The 28-year-old former Celtic striker whipped a free kick beside Burnley's defensive wall but his effort rustled the side-netting. While Conor Mitchell seemed to have that attempt covered at his near post, his opposite number Andrew Fisher had to be alert to make an excellent save from Ginnelly's set play at the other end. The winger, recently on loan at Walsall in League One, supplied a beautfully executed in-swinging cross that travelled all the way through and Fisher produced a save to match, flicking the ball over the bar after seeing it late. After Agyei was thwarted by a fine recovering challenge from skipper Platt, with Jamie Thomas guiding the pass through, Rovers could have taken the lead through the impressive Connor Mahoney. The wide man cut in from the right hand side, travelled unchallenged along the bye-line, but chose the wrong option when shooting from a tight angle. Fisher was untroubled from Thomas's low strike from the edge of the penalty area while Platt powered a header wide of the upright from Mahoney's corner as the two rivals continued to trade blows. The best chance of the first half fell to the Clarets and it was wonderfully engineered by George Green. The one-time Everton and Oldham Athletic midfielder, who had a spell on loan with Kilmarnock in the SPL, took Willem Tomlinson out of the equation 20 yards out with a terrific turn but was denied by Fisher as space opened up in front of goal. The away side started to take control of the tie in the final 15 minutes of the half and went close to breaking the deadlock on a couple of occasions before the interval. Former Blessed Trinity pupil Tomlinson poked the ball wide of the target from close range after latching on to Mahoney's exquisite pass and side-stepping Jimmy Dunne inside the box while Rankin-Costello picked out the side-netting when benefiting from Lewis Travis's incisive pass. And Rovers capitalised on that momentum in the second period as they proved too hot for the home side to handle. Rovers' senior collective proved the difference as former Manchester united centre-back Wes Brown marshalled the side expertly from the back while Stokes provided the threat in the final third. It was the latter who opened the scoring early in the half, getting across his marker to flick Mahoney's corner home at the near post. That ultimately took the wind out of Burnley's sails and Rovers were rampant from that moment. Rankin-Costello almost doubled the advantage when climbing above Dunne to meet Travis's cross but his header sailed narrowly wide of the upright. However, the away side did double the lead moments later. Set-piece specialist Mahoney once again provided the pin-point delivery and the trajectory of Platt's header took the ball out of the reach of Mitchell. The Clarets stopper did well to prevent the away side from extending their lead further, getting down well to hbis left hand side to palm another Stokes effort to safety. The Clarets rarely threatened Rovers after the break but, in a rare sight at goal, Dunne cranked his neck muscles to direct substitute Dwight McNeil's cross goalwards but the defender's header was wide of the upright. Rovers were out of sight in the 73rd minute and it weas that man Stokes again who did the damage. Mahoney claimed his third assist of the game as he pulled the ball back from the left flank and Stokes was first to react as he stabbed the ball in to the roof of the net at the near post. Clarets captain Aiden O'Neill had the opportunity to reduce the arrears late on when drawing Fisher in to a save at his post but it was Rovers who were the more clinical. They were four goals to the good with 12 minutes of normal time remaining and it was Platt who popped up once again inside the penalty area to bag his brace. The centre-half had proved an aerial threat throughout the fixture and nobody was close to him when he sent a looping header beyond Mitchell from Rankin-Costello's wonderfully driven cross. They could have inflicted a wider margin of defeat on their rivals too, but Mitchell floated to his left hand side to beat Travis's curling shot away.